MEC for Economic Development, Environmental Affairs and Tourism Honourable Sakhumzi Somyo (seen above) officially opened the Kouga Wind Farm which is generating enough electricity to supply approximately 50 000 average South African households with electricity annually and mitigating over 270 000 tons of greenhouse gas emissions annually. The latest CSIR report outlines that in the first six months of 2015 renewable energy provided a huge net financial benefit to the country contributing a total net benefit of R4 billion to the economy. During the wind farm’s two-year construction period, more than 1 000 temporary jobs were created through its engineering, construction and procurement contractor, Nordex. The project also made use of the services of 15 SMEs with the focus on the local community. The Kouga Wind Farm provides an attractive investment opportunity for its local and international investor base comprising of STANLIB Asset Management on behalf of STANLIB Infrastructure Private Equity Fund 1, Evolution One Fund, a specialised clean energy investor managed by Inspired Evolution, Red Cap Investments, Eurocape Renewables, Afri-Coast Engineers and a local community trust financed by the Industrial Development Corporation. These investors secured long-term debt funding of approximately R1.6 billion for the construction and operation of the project from commercial lenders including Standard Bank, Nedbank, Liberty, Mergence and the Industrial Development Corporation. 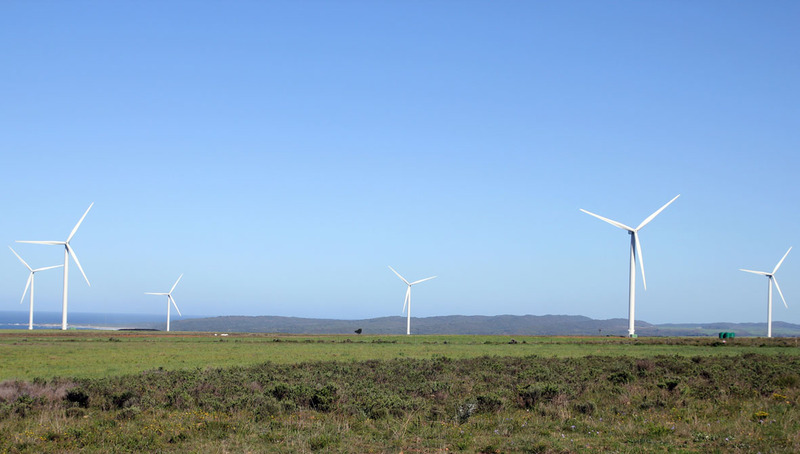 A key focus of the Kouga Wind Farm is uplifting the communities in which the wind farm is involved, and the neighbouring communities of Sea Vista and Umzamowethu are the primary beneficiaries with the Kouga Wind Farm already investing about R1.7 million in health, child care, food security, education, sport, transport and infrastructure development. Some of the school children on site at the official opening today. EC Somyo, who was on site for the official opening and cut the “Circle of Friends” ribbon, said the national renewable energy procurement process required increasing commitments towards local content and the Eastern Cape could become a centre of sustainable energy manufacturing and supply for the African Continent. “If the Eastern Cape can manufacture luxury vehicles of the highest quality, then given the right support and conditions, there is no doubt that the province can diversify further in the manufacturing of energy systems and components. I look to the Kouga Wind Farm and all the esteemed people here today to join hands in working towards the realisation of this vision,” said MEC Somyo. Projects are chosen to meet the needs of the community and the plans of the local municipality, based on key focus areas that were identified – namely education and literacy, skills development and training, healthcare and transport, as well as information technology and communication. Upcoming projects include assisting the Healthy Mom and Baby Clinic in Jeffrey’s Bay, supporting the Sea Vista Clinic in St Francis Bay and the Sea Vista Primary School Kitchen, the upkeep of Talhado Haven, improving the infrastructure at Sandwater Primary School, providing Environmental Management Training to community members, and giving eight tertiary education bursaries to current Grade 12 learners to study at a tertiary institution of their choice. 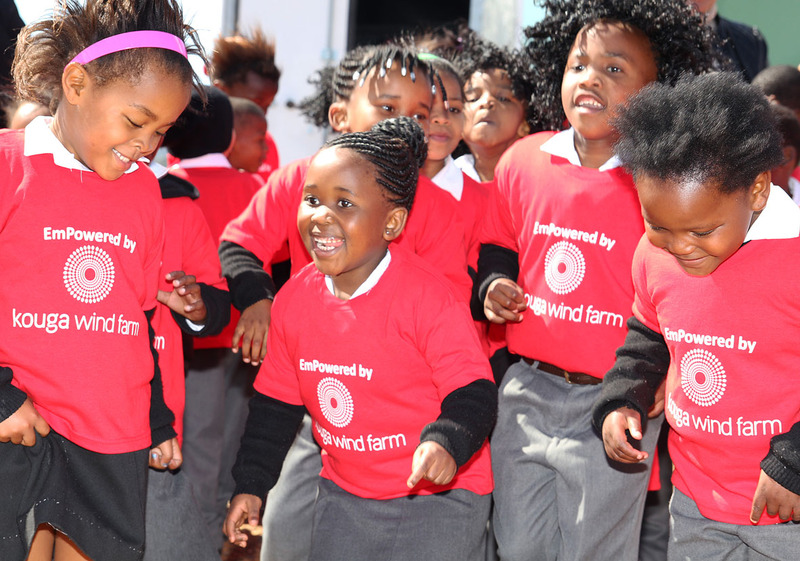 “I am delighted so to see that the Kouga Wind Farm has taken concrete steps towards skills development by placing so much focus on childhood development, supporting education at foundation and secondary phases, and providing bursaries for tertiary education,” said MEC Somyo.